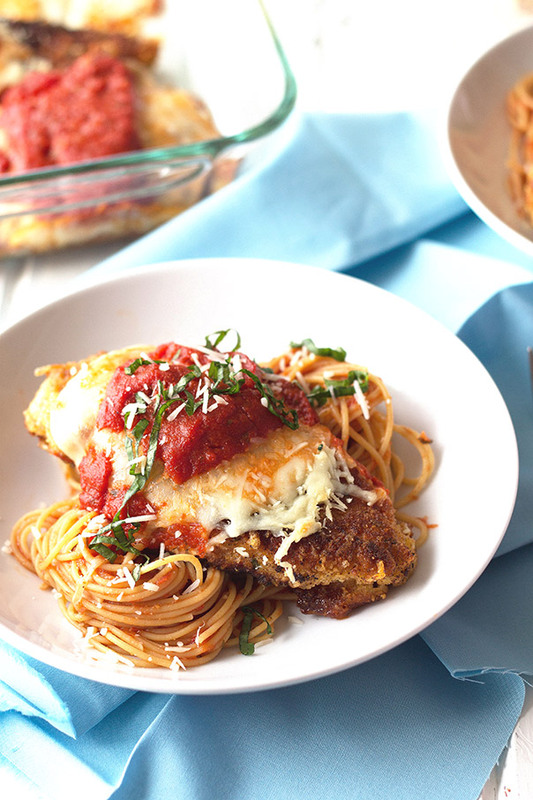 This Chicken Parmesan is a quick and delicious meal that can be on your table in 30 minutes. And it’s way better than what you may get dining out!! Hey CGH readers, it’s Malinda from Countryside Cravings. Most of the time when I order chicken parmesan I am greatly disappointed!! It’s usually soggy, the chicken is dry and sometimes even rubbery. YUCK! I do realize this dish requires dirtying a few dishes, which I absolutely hate! But, it was the best way I found to get that nice crispy exterior and juicy chicken on the inside. SO, in my opinion it is worth it. It really is a simple dish to make, trust me. The breading part is probably the hardest. I like to serve this with pasta and a salad but the pasta is completely optional. It would also be great with your favorite steamed vegetables. And for kid approval– my kids love it, in fact it is my 20 month olds favorite. I can’t feed it to her quick enough! 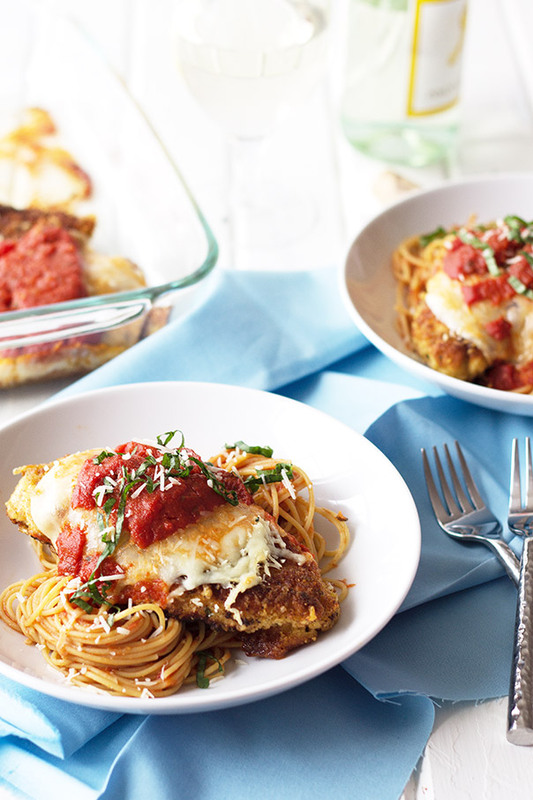 In a shallow dish combine the breadcrumbs with ½ cup grated Parmesan cheese. In another shallow dish combine the egg and milk. Place flour in another shallow dish. You should have three shallow dishes now. Cut each chicken breast in half horizontally to make them thinner. You will now have 4 pieces of chicken. Heat oil in a large skillet over medium to medium low heat. Place 1 piece of chicken in the egg mixture and coat well. Dip into the flour and coat well, shake off excess. Dip back into the egg then into the breadcrumb mixture. (sometimes I use my hands to help press the mixture onto the chicken) Repeat with remaining chicken breasts. Place in hot skillet and fry just until lightly golden on both sides. About 5 minutes. Place chicken in a 9×13 baking dish. 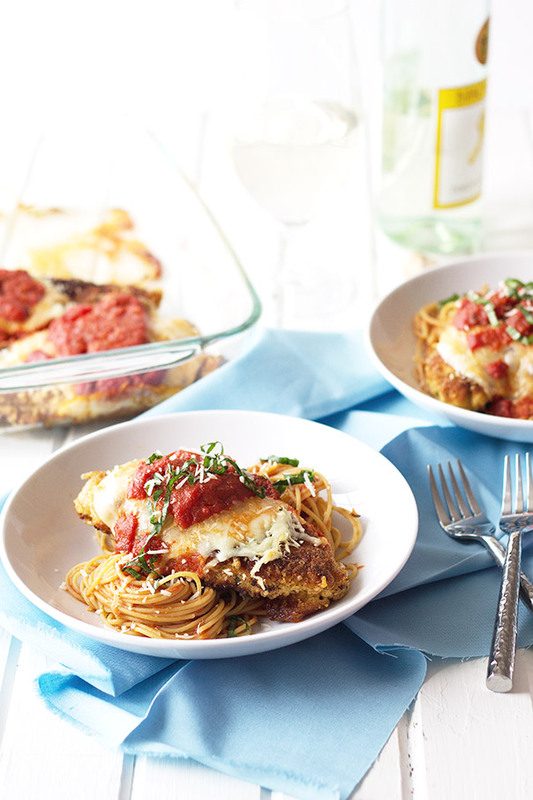 Top each breast with 1 slice of provolone, some of the shredded mozzarella and the remaining grated Parmesan cheese. 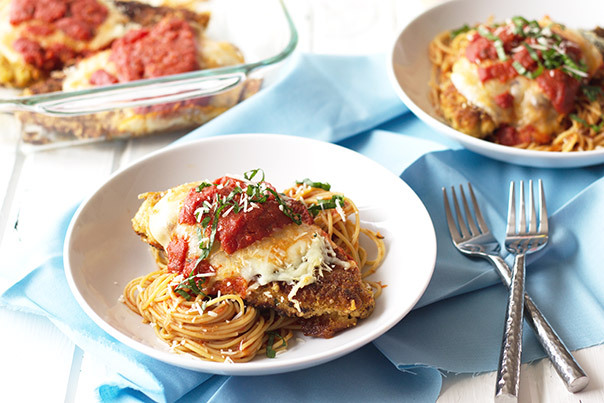 Evenly divide the marinara sauce on top of the chicken breasts. Bake for 15 minutes or until cheese has melted. Serve with hot cooked pasta and marinara sauce if desired.